Carol Harper is a speaker and an author on a mission. That mission is to help women raise their self-esteem so they can reach their full potential. If you are searching for your purpose, you must hear Carol's inspiring talk. condition. She survived but had six surgeries to rebuild her face. She learned to see her inner beauty and shares this message with other women. Carol knows adversity and can help others stay positive during turbulent times in their lives. God helped Carol heal her emotional wounds and now she is helping others through her speaking and books on self-esteem. 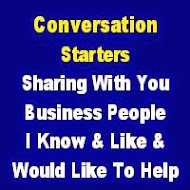 Mention you saw this in Michael Eilermann's networking blog and get a free thirty minute coaching session with Carol.